Rainfall in Lima, Peru is virtually zero and humidity is nearly 100%. 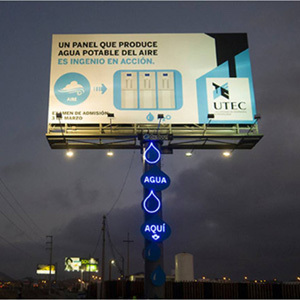 Researchers at the University of Engineering and Technology (UTEC) in Lima and advertising agency Mayo Peru DraftFCB partnered to create a billboard that captures moisture from the air and converts it into filtered drinking water. The billboard contains hidden harvesting, conversion and purification mechanisms that include an air filter, condenser, carbon filter, and cold tank. These components make up an electric system that utilizes reverse osmosis to deliver 25 gallons of drinkable water at the base of the billboard, on a daily basis. The idea came about because UTEC was facing a slump in enrollment as the new semester approached; the engineering department wanted a way to attract more engineering students to the university. They went to Peruvian ad agency Mayo Publicidad, and the partnership of engineers and marketers crafted an advertisement that would provide a very visible demonstration of the university's engineering projects. The water-collecting billboard was born. Since installation of the billboard in December 2012, enrollment to the university has increased by 28%.